The occurrence of a sticking point during the performance of the bench press is common to all individuals who perform this exercise. In order to maximize your bench pressing ability you must attempt to overcome sticking points as much as possible. Bear in mind, however, that you can never totally eliminate a sticking point. What you can do is move the sticking point upwards, and increase the amount of weight that you can handle. The first step in overcoming a sticking point -- moving it upwards -- is to accurately determine where the sticking point occurs. This is where most lifters make their first mistake. Many trainees determine their sticking point by analyzing unsuccessful lifts. The point where they fail is, they assume, where the sticking point occurs. This, however, is not necessarily so. The proper way to determine where the sticking point occurs is to observe successful bench presses. The best method is to perform several sets of bench presses with as weight that will allow from 3-6 reps. Your only concern should be the successful completion of the lift, while someone watches you perform the lift attempting to determine the sticking point. The area where the bar's ascent slows down of momentarily comes to a halt is where the sticking point occurs. 2.) You can isolate the specific muscles that are dominant when the sticking point occurs. The point of either method is to strengthen the muscles which in turn will push the sticking point upwards. The first method, isometrics, is a static form of exercise. That is, there is no movement; the muscle is exercised only at one point along its range of motion. Supposing that your sticking point occurs during the middle range of the bench press. Here is how isometrics would apply. Using a power rack, set the pins at the point where the sticking point is most pronounced. Then, assume the exact position your would be in for a full-range bench at that part of the lift, and take an empty exercise bar and press it against the pins gradually increasing pressure until you are exerting a maximum effort. Hold at maximum force for about six seconds, without changing your body position. Again, it is important that you remain in the same position as you would be if this were a full-range bench press. To insure that you work the sticking point along its entire range you could place the pins at high, middle, and low parts of the sticking point and work each area separately. Isometronics, on the other hand, are short range movements with an isometric hold at the end. Assuming once again that your sticking point occurs during the middle portion of the lift, here's how isometronics would be used. 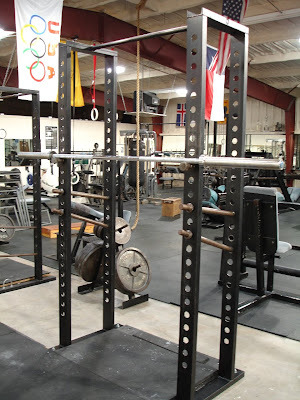 You will again need the use of a power rack, but this time position two sets of pins: one pair at the bottom of your sticking point and one pair at the top of your sticking point. Start with the bar on the bottom pins and press upward until it touches the upper pins. Continue this for 3-5 reps. On the last rep press the bar against the upper pins as hard as you can and hold it for approximately six seconds. Here again, a position identical to that used in your full-range bench press is mandatory. The point is not to see how much weight you can lift by shifting position. This is assistance work, used to strengthen your weaknesses and thereby increase the lift. Define fun for yourself and find a way to experience it while training. Pauses simply involve taking a moderate weight and lowering it to a point about two inches below your sticking point, holding the weight at that position for several seconds and then pressing the weight upwards. This can be continued for reps. Negative pauses, on the other hand, require the use of very heavy weights. Starting from a point of full contraction -- lockout position -- lower the weight very slowly. When you reach the sticking point, stop the weight and attempt to hold it there for as long as possible. Use spotters. Isometric negatives are very similar to negative pauses. The main difference being that you start at the sticking point. You will need at least two spotters to hand you the weight at the place where your sticking point occurs. At this point hold the resistance at that position for as long as possible. When the weight begins to drop don't give up -- continue to delay the bar's descent for as long as possible. Be sure your spotters are alert and ready to catch the bar and help you up with it. Let's now examine how we can isolate the specific muscles that are involved when the sticking point occurs. First of all, we must consider the relationship of your elbows to your torso. If your elbows are at a 45-degree angle to your torso the initial surge of strength is supplied by the deltoids. After about 4-5 inches the pectorals and triceps take over with the triceps supplying the final strength needed for lockout. This style of benching is characterized by a narrow bench press grip. As the angle of your elbows to your torso increases, less emphasis is placed on your deltoids. At a 90-degree angle, which means your elbows are perpendicular to your torso and which is characterized by a wide grip, most of the stress is placed on the chest from the beginning of the movement. Towards the end of the movement triceps strength becomes very important. Sticking points will normally occur at a transitional stage where one muscle group takes over from another. Thus, if you keep your elbows at about 45 degrees to your body the sequence of power is: deltoids - chest - triceps, whereas if your keep your elbows at a 90-degree angle to your torso the sequence is: chest - triceps. Deltoids: front deltoid raise performed either standing or lying. Chest: dumbbell flyes, incline presses. Triceps: lying triceps extensions, dips. With regard to the shoulders, the best exercise is the lying deltoid raise. If you are unfamiliar with this exercise here's how it is performed. Assuming your normal bench press position start with the barbell over your head, then slowly lower it until it touches your lower body, the raise the bar back over your head. At all times keep your arms straight. To briefly summarize, sticking points can be attacked in two different ways. You can isolate the specific muscle group involved in the sticking point, or you can work the muscles along the area where the sticking point occurs. Both methods are effective, and for maximum results you should use both.